Hampton’s coach has cherished being able to lead the Lady Pirates after suffering a stroke on June 27. 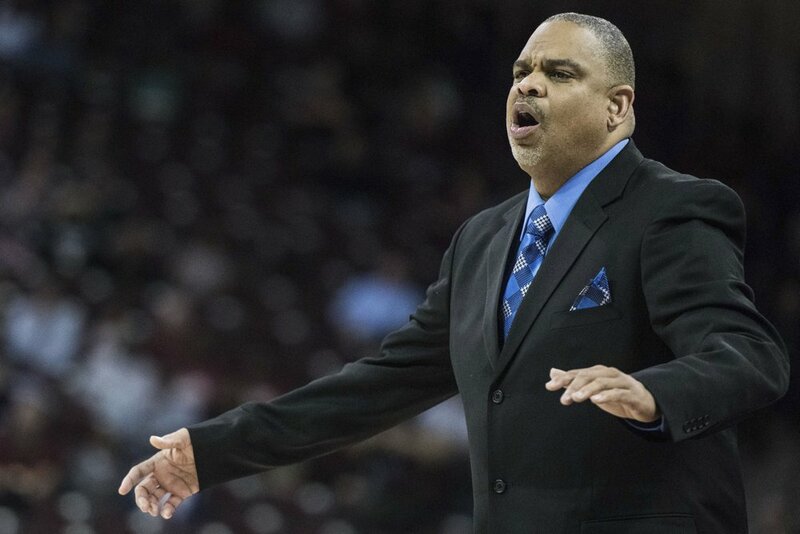 The 55-year-old coach, who has guided Hampton to the NCAA Tournament in six of the past eight seasons, was told originally by doctors that he would probably need to take the year off from coaching to recover. He would have none of that. Six months later after intense “boot-camp rehab”, the only remnants of the stroke are a torn rotator cuff in his right shoulder he suffered when he fell, and a slight limp. He’s still doing some rehab to improve his strength, including water aerobics — which he did before suffering the stroke. He returned to campus before the team started practice in early October and earned his 200th career win just before Thanksgiving. Hampton went 4-7 in nonconference play, but has started 2-0 in the Big South. The New York native is well aware how lucky he was to be coaching. Six was driving his wife Angela to Johns Hopkins Hospital in Baltimore for her regular appointment to deal with a muscle disease she suffers from. It was a drive he had made hundreds of times. Six and his wife usually stop along the way from their home in Virginia, but he had just gotten a new car and was having so much fun driving it that the pair made the trip without stopping that day. About an hour before reaching the hospital, the coach felt a heaviness in his right arm. His wife asked him what was wrong, but he said nothing was wrong, so as not to worry her. Yet he knew something was off. A friend of his wife met them at the hospital and she noticed Six was struggling to get out of the car. He tried to hide it from his wife, but he couldn’t. Fortunately, there was a doctor in the parking lot who rushed over to help. After making it into the emergency room under his own power he fell again as his vitals were being taken. A CT scan confirmed the stroke. He had a blood clot on the left side of the back of his head that affected the area of the brain that controls balance and mobility on the right side of his body. The doctors were able to dissolve the blood clot with a medication called Tissue Plasminogen Activator. That medication is only effective in the first three hours after symptoms begin. About a week after having the stroke, Six was sent to a rehab facility at the hospital. He ended up sharing a room with his wife, who was continuing her therapy for the polymyositis, which causes muscle weakness on both sides of the body and limits movement. Six attacked his rehab during his six-week stint at Hopkins. The coach was discharged at the end of July, a week before his wife. The pair went to live with their daughter in Maryland, but a few weeks later Six decided to return home to Virginia as his daughter had a pair of young twins to look after and he felt he would recover sooner having to do things for himself. Coach Six said he would wait until after the season to take care of the rotator cuff. He hopes that won’t be until after another NCAA Tournament appearance. “I got a lot of basketball to worry about first,” he said smiling.